Another great recipe from my husband! He served these with miso soup and Japanese noodles. Combine all ingredients except butter and outside breading and mix well. Roll mix into 2 inch balls, roll in breading, and flatten to 1/2 inch. Refrigerated for 1 hour. In a no-stick skillet melt butter on medium heat. Cook patties in butter 3- 4 minutes on each side. Place All ingredients into water and bring to boil. 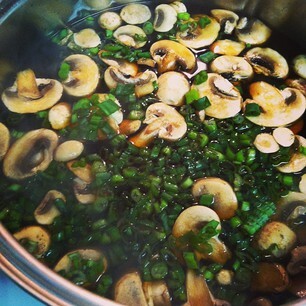 Add noodles and retain boil for 10 -12 minutes. Use slotted spaghetti tongs to plate noodles and place crab cakes on top of noodles. These look delicious. 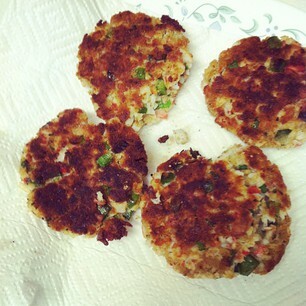 I like to make my own crab cakes although, I don't do it often. Thank you for the recipe. I. Love. Crab. Cakes.!!!!!!!! Soooo yummy. Thanks for linking to fine finds friday!!!! I love crab cakes! I pinned this one so I can find it again. Those look terrific! Cannot wait to serve them up! Love this! I’d like to invite you to link up to Saturday Spotlight @ Angels Homestead. The party is open from 12 am Saturday, until 12 midnight Wednesday.